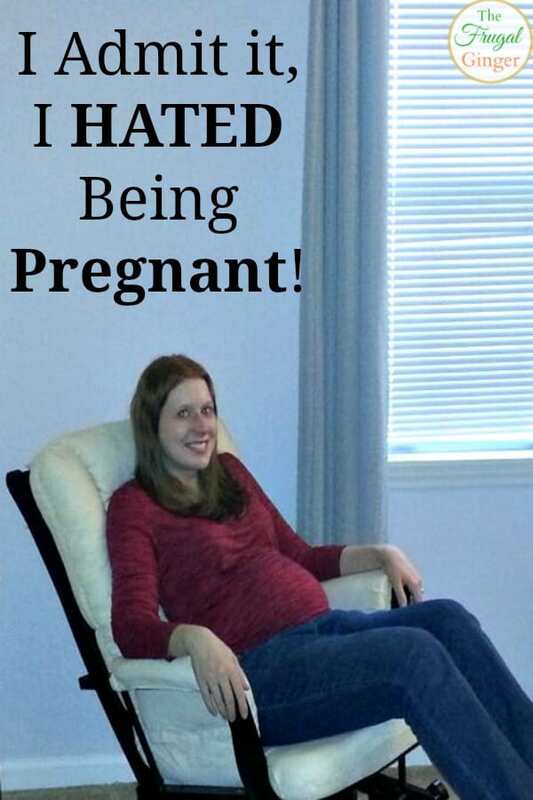 Yes, I admit it, I hated being pregnant. I know that as a mother, that is not something I am supposed to say. I know that I am truly blessed to have been able to give birth, as that is a luxury not everyone gets. I love my daughter more than anything and I wouldn’t trade her for the world. But I was not prepared for how much I would be miserable throughout my pregnancy and I am sure I’m not the only one who feels that way. I want to let every other miserable pregnant woman out there know that is is OK to complain and be crabby when you don’t feel well. Your body is going through some major changes and I am giving your permission to complain all you want to! I know that for some women pregnancy is a wonderful and magical time. They truly love being pregnant and have that remarkable glow about them. The only glow I had was sweat from being nauseous all day long. I wanted so much to enjoy my pregnancy like those other women but it just wasn’t for me. I read the What to Expect When Your Expecting (affiliate links are used in this post) but they did not prepare me for some of the things that was happening to my body. No one told me you could have morning sickness all day long and never be able to throw up. I wanted so badly to throw up just so that I could feel better and get some relief, but it never came. I just felt nauseous all day, every day of my first trimester. I didn’t know what tired was until I became pregnant. I was working full time as a lab technician so I was on my (swollen) feet a lot during the day. By the time I came home, I was ready to eat dinner and go straight to bed. I couldn’t even stay up and watch The Big Bang Theory. I was passed out on the couch by 7:30. This picture was when my fiancé caught me passed out on the couch before 7. 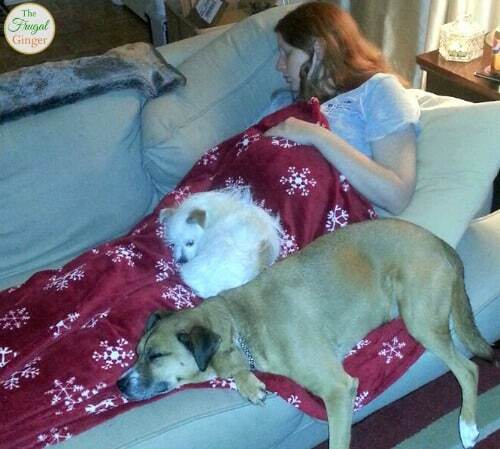 I didn’t even know that the dogs had climbed up on me, I was out! I had also read that women could get heartburn when they are pregnant. No one told me that my esophagus would be on fire every time I just looked at something spicy. I would eat saltine crackers and still get heartburn! I couldn’t sleep because if I laid down, you guessed it, I got heartburn. It was relentless and I was one of those pregnant women who didn’t want to take any kind of medicine. After a week of no sleep and constant heartburn, Zantac became my best friend. It was the only thing that would work, and I tried everything! Not to mention all of the embarrassing things that happen to your body when you are pregnant. My fiancé still brings up the time when I couldn’t stop farting one day. Every time I took a step, I farted! It’s hilarious now but it was so embarrassing at the time, I really couldn’t help it. Or that time that I experienced a huge hemorrhoid and couldn’t sit down without being in severe pain for 3 days! I had never had one before and I hope to never have one again! If you are expecting, make sure you are stocked up on Witch Hazel pads, just in case you get one. Trust me, you don’t want to be out of them. There was one thing that helped me get through it all and let me feel like I wasn’t a freak for not being Supermom and loving this whole pregnancy thing. I read the book, Belly Laughs by Jenny McCarthy. This book was so honest and blunt about everything that she experienced in her pregnancy. It was just what I needed and it really spoke about what I was going through. Not to mention it is very funny! I just know that there are a lot of women out there who struggle through their pregnancy and I wanted them to know that they are not alone. It is OK to hate being pregnant, I hated being pregnant. I just kept focusing on the day when I would get to meet the little person who was constantly kicking my ribs. I knew that I would see that face and fall in love instantly and I would do it all over again if I needed to. O my goodness, I’m not loving being pregnant and I’ve got it SO easy compared to you. I’m 20 weeks and I’m not sick anymore, I don’t have heartburn and I’m not THAT tired. But my back hurts like there’s a knife in it, I can’t sleep, I have to pee every 15 minutes (sometime every 15 minutes for three or four hours in a row!) And I honestly can not imagine how these woman workout, when I move it feels like stomach is one giant round ligament. And it can only get worse over the next 4 months right?! Yikes. That’s probably the scariest part. Thanks for this 🙂 it’s nice to know I’m not alone. I’m so glad you know that you aren’t alone. I felt like all the other pregnant women around me where working out all the time while I didn’t have the energy to even run errands :). I told my fiance the reason we have to carry the baby for 9 months is because that is a long enough time for us to be sick of being pregnant; we aren’t scared of giving birth, we just want the baby out already!